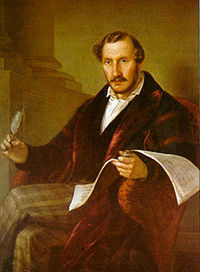 Gaetano Donizetti, portrait by Giuseppe Rillosi. Domenico Gaetano Maria Donizetti (November 29, 1797 – April 8, 1848) was an Italian opera composer from Bergamo, Lombardy. 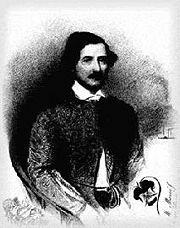 Donizetti's most famous work is Lucia di Lammermoor (1835). Along with Vincenzo Bellini and Gioacchino Rossini, he was a leading composer of bel canto opera. Donizetti had a friendly and sincere manner about him. He carried a sense of responsibility to nurture and sustain Italian music and he acted on these concerns not only through his many compositions but also through his support for musicians who were starting afresh. The youngest of three sons, Donizetti was born in 1797 in Bergamo's Borgo Canale quarter located just outside the city walls. His family was very poor with no tradition of music, his father being the caretaker of the town pawnshop. Nevertheless, Donizetti received some musical instruction from Giovanni Simone Mayr, a priest at Bergamo's principal church (and also himself a composer of successful operas). Donizetti was not a notable success as a choirboy, but in 1806 he was one of the first pupils to be enrolled at the Lezioni Caritatevoli school, founded by Simon Mayr, in Bergamo through a full scholarship. He received detailed training in the arts of fugue and counterpoint, and it was here that he launched his operatic career. After some minor compositions under the commission of Paolo Zanca, Donizetti wrote his fourth opera, Zoraïda di Granata. This work impressed Domenico Barbaia, a prominent theatre manager, and Donizetti was offered a contract to compose in Naples. Writing in Rome and Milan in addition to Naples, Donizetti achieved some success (his 31 operas written in the space of just 12 years usually met with popular success, but the critics were often unimpressed), but was not well known internationally until 1830, when his Anna Bolena was premiered in Milan. He almost instantly became famous throughout Europe. L'elisir d'amore, a comedy produced in 1832, came soon after, and is deemed one of the masterpieces of the comic opera, as is his Don Pasquale, written in 1843. Shortly after L'elisir d'amore, Donizetti composed Lucia di Lammermoor, based on the Sir Walter Scott novel The Bride of Lammermoor. It became his most acclaimed opera, and one of the high points of the bel canto tradition, reaching stature similar to Bellini's Norma. After the success of Lucrezia Borgia (1833) consolidated his reputation, Donizetti followed the paths of both Rossini and Bellini by visiting Paris, but his opera Marino Falerio suffered by comparison with Bellini's I puritani, and he returned to Naples to produce his already-mentioned masterpiece, Lucia di Lammermoor. As Donizetti's fame grew, so did his engagements, as he was further hired to write in both France and Italy. In 1838, he moved to Paris after the Italian censor objected to the production of Poliuto (on the grounds that such a sacred subject was inappropriate for the stage); there he wrote La fille du régiment, which became another success. Donizetti's wife, Virginia Vasselli, gave birth to three children, none of whom survived. Within a year of his parents' deaths, his wife died from cholera. By 1843, Donizetti exhibited symptoms of syphilis and what is known today as bipolar disorder. After being institutionalized in 1845, he was sent to Paris, where he could be cared for. After visits from friends, including Giuseppe Verdi, Donizetti was sent back to Bergamo, his hometown, where he died in 1848, after several years in the grip of insanity. After his death Donizetti was buried in the cemetery of Valtesse but in the late nineteenth century his body was transferred to Bergamo's Basilica of Santa Maria Maggiore near the grave of his teacher Simone Mayr. Donizetti is best known for his operatic works, but he also wrote music in a number of other forms, including some church music, a number of string quartets, and some orchestral works. He is also the younger brother of Giuseppe Donizetti, who had become, in 1828, Instructor General of the Imperial Ottoman Music at the court of Sultan Mahmud II (1808-1839). Donizetti's vocal style enriched the bel canto tradition which Gioacchino Rossini and Vincenzo Bellini had made popular. These three composers are generally accepted as the primary exemplars of early nineteenth century bel canto writing. 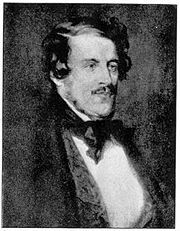 During his life, and for a considerable period after his death Donizetti's works were held in vast popular acclaim, but by the beginning of the twentieth century they had been almost completely overshadowed by the heavier masterpieces of Wagner, Puccini, and Verdi, perhaps due to the technical-demand bel canto singing requires. However, since the 1950s a growing interest in the bel canto repertoire has lead to more frequent performances of Donizetti's operas, and Lucia di Lammermoor, La fille du régiment, Don Pasquale, and L'elisir d'amore have assumed more or less constant places in the standard repertory. Donizetti composed about 75 operas, 16 symphonies, 19 string quartets, 193 songs, 45 duets, three oratorios, 28 cantatas, instrumental concertos, sonatas, and other chamber pieces. Ashbrook, William. Donizetti and his Operas, Cambridge: Cambridge University Press, 1982. Ashbrook also wrote an earlier life entitled Donizetti in 1965. Sadie, Stanley, (ed.) The New Grove Dictionary of Music and Musicians, Volume 7, London: Macmillan Publishers Ltd., 2001. The 1980 edition article, by William Ashbrook and Julian Budden, was also reprinted in The New Grove Masters of Italian Opera, London: Papermac, 1984: 93-154. Sadie, Stanley, (ed.) The New Grove Dictionary of Opera, Volume 1, London: Macmillan Publishers Ltd., 1997: 1201-1221. Saracino, Egidio, (ed.) Tutti I libretti di Donizetti, Garzanti Editore, 1993. Weinstock, Herbert. Donizetti, London: Metheun & Co., Ltd., 1964. (UK publication date). Petténi, Giuliano Donati. Donizetti, Milano: Fratelli Treves Editori, 1930. Zavadini, Guido. Donizetti: Vita - Musiche - Epistolario, Bergamo: 1948. Allitt, John Stewart. GAETANO DONIZETTI – Pensiero, musica, opere scelte, Milano: Edizione Villadiseriane, 2003. Allitt, John Stewart. DONIZETTI – in the light of romanticism and the teaching of Johann Simon Mayr, Shaftesbury, Dorset, UK: Element Books, 1991. Also see John's website . Bini, Annalisa and Jeremy Commons. Le prime rappresentazioni delle opere di Donizetti nella stampa coeva, Milan: Skira, 1997. Black, John. Donizetti's Operas in Naples 1822-1848, London: The Donizetti Society, 1982. Kantner, Leopold M., ed. Donizetti in Wien, papers from a symposium in various languages, Primo Ottocento, available from Edition Praesens. ISBN 3706900068 ISSN 156008921. Egidio, Saracino, ed. Tutti i libretti di Donizetti, Milan: Garzanti, 1993. This page was last modified on 17 May 2017, at 16:46.